Pro-Action takes mass-produced motorcycles and builds custom suspension for them to the specific needs of the owner. We start by selecting the correct spring rates to uphold the weight of the motorcycle and rider. We then determine the correct Pro-Action Valve Bodies to be used to match up with the valving systems to be installed. 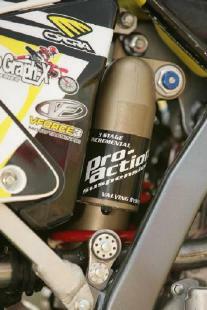 Pro-Action uses many categories of shock and fork valving: Motocross, Supercross, Freestyle, Desert, Supermoto, and Off-Road. Once one of these categories is chosen, Pro-Action then designs a system that specifically fits the individual for height, weight, type of riding, class of competition, normal finishing position, and years of experience. Ground conditions and terrain are also considered. Pro-Action has always been the pioneer of multi stage valving. When the world had single-stage, we had two-stage. When the world went to two-stage, Pro-Action went to three-stage. After years of research and development with three-stage valving, we evolved it into our exclusive incremental system. The Pro-Action three-stage, incrementally pressure-sensitive, self-adjusting valving system not only has a mid-range circuit that does not exist in any stock shock, but also has increments of valving within each stage. The result is a valve or combined group of valves that compensate for any pressure that can be exerted by the speed of the shaft due to the striking of a bump without a trace of valve collision or mid-stroke harshness. Link this compression circuitry with our exclusive catch valve rebound damping and you have truly entered into the third dimension of shock absorber technology. 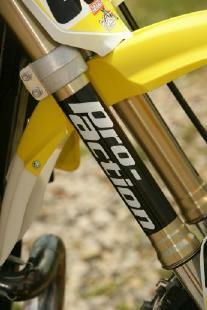 ​Pro-Action has been the innovator of front fork valve body design technology. Our pistons match flow dynamics of the fork with critical edge of hydraulic lock valve body designs. We now produce 12 types of valve bodies. These valve bodies have the most direct flow patterns of all valve bodies produced. 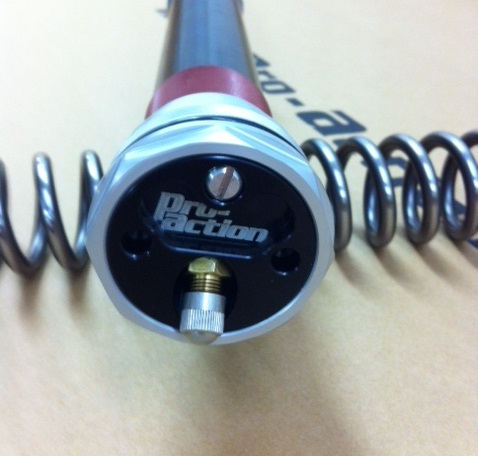 This direct flow design eliminates harshness in the fork and reduces rider fatigue. The edge of hydraulic lock design eliminates bottoming. Super Cross Valving uses a two-stage system. Motocross valving uses a two-stage system with a quick opening circuit for choppy acceleration bumps. The off-road valving uses a three-stage system to eliminate deflection off rocks and roots and provides excellent mid-range manners and great resistance to bottoming. The result is the finest working front fork system ever built. Imagine a front fork that stands up tall, is plush on initial hits, firm on big hits, and progressively soaks up everything in between. Convert your WP AER48 or Showa TAC forks to a single sided spring kit with air assist. The best thing about spring forks is the low speed pick up and the only good thing about air forks is the bottoming resistance. We have combined these two systems and used the best of both worlds. The spring picks up all the small bumps and the air kicks in at the end of the stroke to prevent bottoming. We can run a little lighter spring rate than you would normally run allowing for ultimate plushness in the small bumps while using the air pressure to keep from bottoming. This system does not bleed off air like your stock forks, you won't pick up pressure throughout your ride because of expansion, and most of all it makes tuning a breeze. These are as close to Factory as you can get. $599.00 for the Hybrid kit and $115.00 for the spring.